The same day that the Tour de France finished in Paris under the Champs Elysees, the MSA Endurance Team was finishing two weeks of National Championship racing in Hagerstown, MD. During the course of two National Championship events, road cycling and mountain biking, MSA rode away with three National Championship titles, two silver medals, and numerous top-ten finishes. MSA seniors, Katie Clouse and Jane Tullis, dominated the women's 17-18 age category in both the road race and criterium. The road race was one of the closest sprint finishes in the history of National Championships and saw Katie cross the line a mere half-inch ahead of Jane. The sprint was so close that neither rider knew who won until the race officials made the final call based on the finish-line photo. In the criterium, Katie and Jane were highly active for the entirety of the 45 minute event, constantly attacking off the front and covering their competitors moves. With the field all together going into the final lap and a field sprint assured, Katie positioned herself perfectly going into the final corner and launched a textbook sprint to take the win by over a bike length. Jane fought through traffic to unleash a great sprint, as well, and finished an impressive 4th, earning herself her second trip to the podium in as many days. In the men's road race and criterium events, MSA saw success with a combination of new and returning student-athletes. For the 15-16 road race, incoming sophomore, Braiden Voss, survived a flurry of attacks to hang tough with the greatly reduced peloton and sprint for a very respectable 8th place. The following day in the criterium, the men's 15-16 event was one of the fastest and least predictable races of the day. Braiden again positioned himself perfectly lap after lap, staying in front of splits and crashes, and in another great showing of his sprinting prowess finished 6th, just millimeters off the podium. Sophomore Luca Scuriatti also had a very good day and, despite waking up that morning feeling ill and unsure about racing, managed to position himself at the front all day and finish a solid 13th place. In the men's U23 category, senior Simon Jones and recently-graduated Evan Clouse showed impressive strength in their first year out of the junior ranks. Selfless teamwork in both the road race and criterium by Evan allowed Simon to contest the sprints as fresh as possible, and Simon did not disappoint with 16th and 11th place finishes, respectively. Incoming junior, Daniel Vargas, has only been competing for about a year, and was attending road nationals with the primary objective of gaining valuable experience. Unfortunately, several flat tires in the men's 17-18 road race and untimely crashes in the criterium took him out of contention, but he left Hagerstown with the knowledge that he has the strength to be competitive and the motivation to find his way onto the podium next year. Youngster Chris Hardee, an incoming freshman, dug deep to hang tough in the blistering fast men's 15-16 road race. 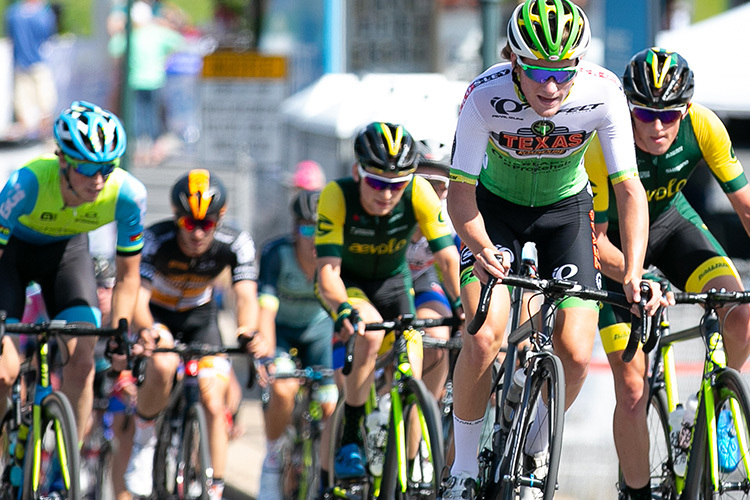 Despite coming unglued from the main group partway through the race, along with multiple other riders, he continued to push hard all the way to the line and finish admirably against many of the best junior cyclists in the nation. The previous week in Snowshoe, WV, Katie Clouse traded in her skinny tires for knobs and suspension and toed the line at Mountain Bike National Championships. In the women's 17+ cross country event, Katie overcame the setback of a flat tire to make her first podium appearance of the weekend with a 2nd place finish. She found redemption, however, in the following day's women's 17+ short-track where she took the win in convincing fashion, which earned her the top step of the podium and the title of Short Track National Champion for the year ahead.